VANCOUVER, B, CA, April 2, 2019 /EINPresswire.com/ -- Bard on the Beach celebrates its 30th season with a lineup that includes a salute to an all-time favourite Bard production, the stage adaptation of an Oscar-winning romantic comedy, a cross-cultural story set in India, and a powerful, rarely-staged political drama. Tickets for all Bard on the Beach plays and special events go on public sale April 3, 2019. “We are celebrating this milestone year by sharing the brilliant words of Shakespeare through dynamic productions that showcase the world-class talents of our directors, cast and design teams, working with innovative concepts that will have impact and relevance for today’s diverse, demanding audiences,” says Bard on the Beach Artistic Director Christopher Gaze. The season kicks off with The Taming of the Shrew, inspired by Bard’s beloved 2007 Wild West production, a high-energy hit; it plays in repertory with the Elizabethan-set romantic comedy Shakespeare in Love, adapted from the award-winning film of the same name; both are on the BMO Mainstage. The Howard Family Stage offers two new Shakespearean productions that run consecutively: All’s Well That Ends Well, set in 1940s India at the time leading up to Indian independence, and Coriolanus, a riveting political drama filled with resonance for our time. •	Exploring Shakespeare – July 6, July 13, July 20 & September 7 at 11am – Simon Fraser University’s Paul Budra leads lively explorations of the season’s four plays. Play ticket prices (regular adult) include all fees & taxes and start at $26. Youth pricing, sponsored by Global BC, is available for patrons ages 6 to 22 at 50% off regular ticket prices. Prices for special events, group bookings and multi-play ticket packages can be found online at bardonthebeach.org or by calling the Bard Box Office at 604-739-0559. All tickets go on sale April 3. Early booking is recommended for best seat selection (all seats reserved) and because many performances sell out in advance. Bard on the Beach gratefully acknowledges the corporate sponsors who support and sustain the Festival and its programs. 2019 sponsors include Season Sponsor Goldcorp; Production Sponsors Avison Young, Lawson Lundell, BlueShore Financial and Lonetree Cider; Season Media Sponsors The Vancouver Sun and Global BC, as well as many other valued sponsors and partners. Bard also thanks the City of Vancouver Cultural Services Department, the Vancouver Park Board, the Province of British Columbia, the B.C. Arts Council, and the Canada Council for the Arts for their continuing support. 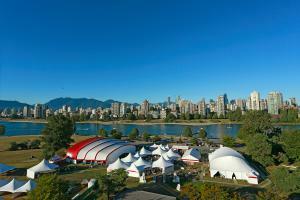 Bard on the Beach is one of Canada's largest not-for-profit, professional Shakespeare festivals. Established in 1990, the annual summer festival’s mission is to perform, explore and celebrate the genius of William Shakespeare, surrounded by the natural beauty of Vancouver, British Columbia, Canada. Bard also offers year-round education and training programs for youth, adults and theatre professionals in its administrative home at the BMO Theatre Centre in Olympic Village as well as in schools and community facilities throughout the Lower Mainland of British Columbia.